One nice thing about staying at a DoubleTree Hotel is having warm chocolate chip cookies handed to you at check-in. Cookies are such a nice thing to enjoy after hours on the road or in the air….or any time really. 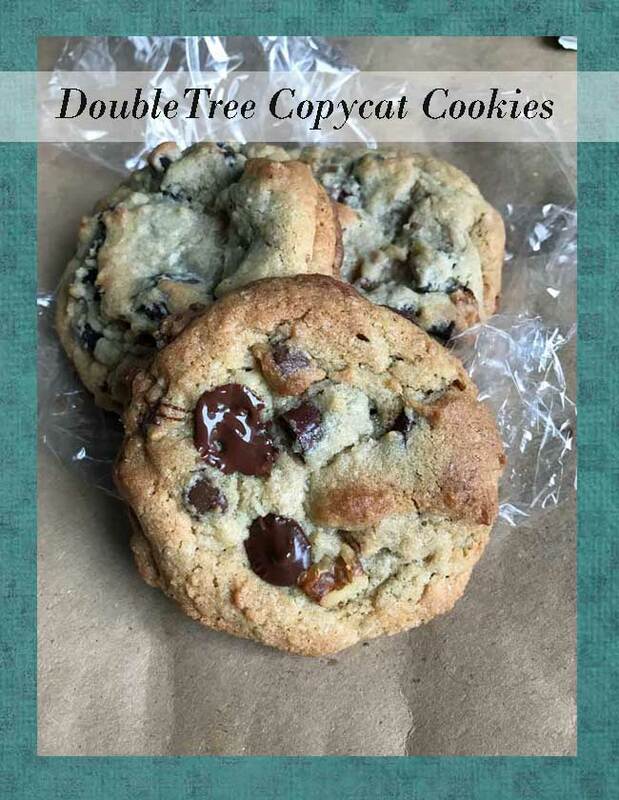 Today I felt like making a batch of DoubleTree copycat cookies while the taste of the actual DoubleTree cookies was still fresh in my mind. I am happy to say this version is indeed, very similar if not identical to the hotel’s. Update: I’ve updated this recipe a bit. It’s basically the TollHouse recipe but with 1/2 cup of ground oats, and then of course the cookies are made much larger. The lemon juice appeared in the original version and I suppose it just makes the dough a bit more acidic. Baking powder would probably do the same thing. Like DoubleTree or not, these are good cookies. They taste more like the hotel’s if you use walnuts, but pecans also work nicely. Another recipe that I think is similar to DoubleTree’s is an old one from Sunset called Chocolate Chip Cookies at Their Best. Preheat oven to 375 degrees. Line baking sheets with parchment paper. Skip this step if you plan to chill the dough (recommended). Place the butter in a large bowl and beat until creamy. Add the sugars and beat on medium speed for about 2 minutes. Add the eggs, one at a time, beating well after each addition. Add the vanilla and lemon juice and mix well. In a separate bowl, stir together the flour, ground oats, baking soda, salt and cinnamon. Add to the creamed butter mixture and stir well to blend. Add chocolate chips and walnuts and stir to combine. Using a 1/4 cup measure or a large cookie scoop, drop the batter on the parchment-lined pans, leaving 2 -3 inches between each cookie. Bake for 13 – 15 minutes or until lightly browned around the edges. Remove from parchment and cool on wire racks. 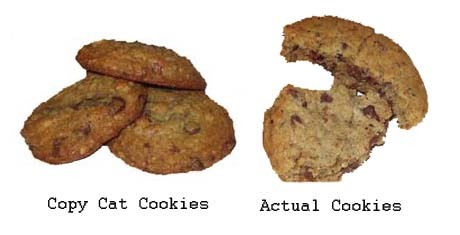 Note: The cookies are more like DoubleTree’s when made with dough that has been chilled overnight. I recommend scooping the dough onto a plate, covering the scooped dough balls, chilling overnight, then baking. My family loves these cookies! But I leave out the walnuts as they are not fans of walnuts. I also use 2 cups of the semisweet and 1 cup of the bittersweet. Yummy! s’kat, the lemon was not detectable. I actually used a little more than the recipe called for. I think it just adds more acid to the batter.The hotel cookies didn’t have any cinnamon flavor, so I just left it out. I have put it in chocolate chip cookies in the past. If you use a tiny, tiny, bit, it adds another dimension. They’re a little bit crisp around the edges, but aside from the crunchiness in the nuts, they’re tender. And yes, I did chill the dough.